← Groundhog Day is coming . . . are you ready? When planning a kitchen remodel, we all know that the important items (and most expensive) are the cabinets, the appliances, the countertop material, and flooring. But . . . there are several details that while not as expensive as the aforementioned items, are important to provide the right feel to your new kitchen. One of these is the backsplash! This sometimes is just what the name implies – the 4″ or so along the back of the countertop where the sink resides. But it can be incorporated into the kitchen design as a whole, tying all the design elements together. 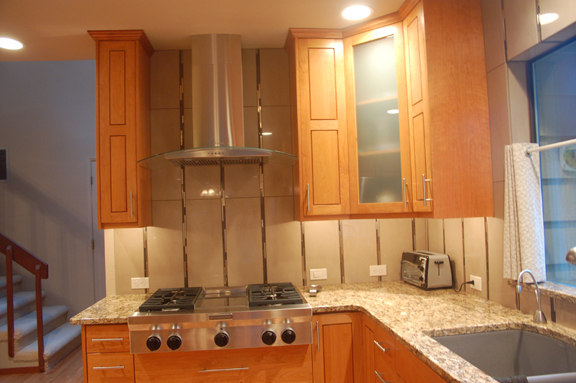 The photo above is one of a local home kitchen remodel our company completed recently. The owners selected the unique tile patterns for both the backsplash and wall covering above the countertop and behind the stove as well. It is a striking focal point for the kitchen. So, what do you think of the matching backsplash/countertop? Too much, or it pulls it all together? The photo is from kitchens.com, their website has lots of great photos to help with visualizing your next remodel project. Hello There. I discovered your blog using msn. That is an extremely smartly written article. I will be sure to bookmark it and come back to read more of your helpful information. Thanks for the post. I will certainly return.